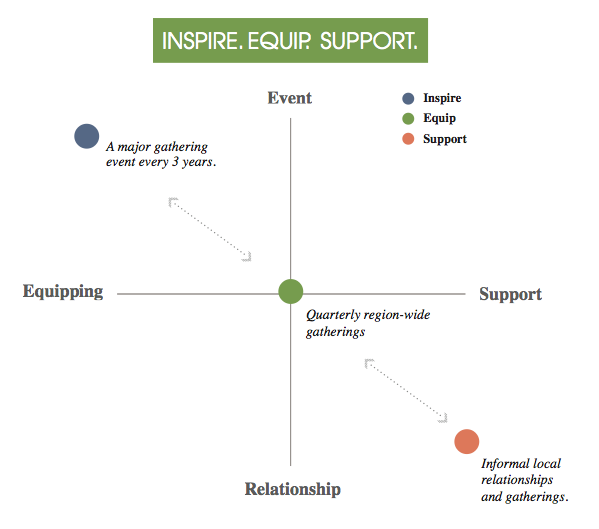 Our vision of inspiring, equipping, and supporting LA pastors is illustrated in the diagram above. The content of our gatherings is plotted on the X-axis, from Equipping (e.g. learning about ministry) to Support (e.g. praying for one another). The context for our gatherings is plotted along the Y-axis, from Event (e.g. highly structured, formal meetings) to Relationship (e.g. unstructured, informal friendships). In our experience, many coalitions of pastors exist exclusively at one point on this graph. TGC LA varies the content and context of our meetings to best accomplish the inspiration, equipping, and support we believe is so valuable, all while respecting the busy schedule of a local church pastor. We hold our largest gathering—a one-day conference to inspire and promote gospel- centered ministry—once every three years. This allows sufficient time to plan and enjoy the conference without overtiring volunteers or over-extending attenders. We hold our region-wide gatherings once a quarter, usually taking summers off. Gathering three times a year maintains momentum and excitement without overwhelming busy pastors. The region-wide gatherings give way to informal relationships amongst pastors in their neighborhoods. These take various forms and happen with varying consistency throughout the year. With the gospel as our center and a realistic structure, TGC LA creates a sustainable culture of inspiration, equipping, and support. We believe that culture will bless our local churches and the city we love. We hope you will join us.